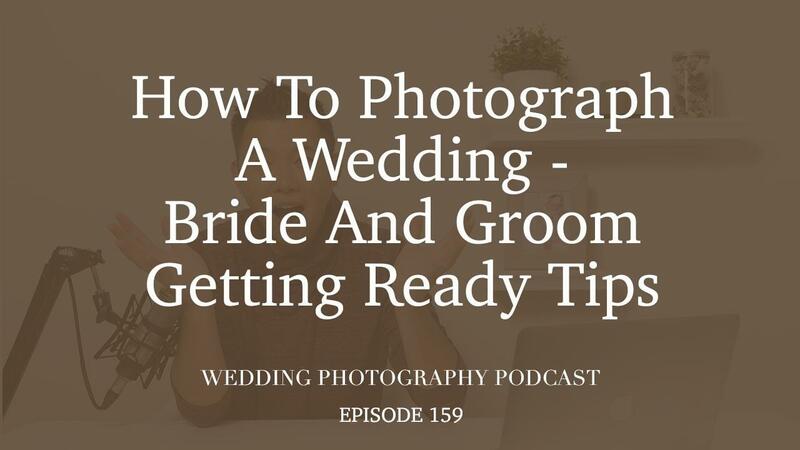 Continuing with my November theme “How To Photograph A Wedding”, in this podcast episode, we’re going to chat about bride and groom getting ready photos. I’ll share with you why this is my favorite part of the wedding day (albeit also the most challenging) and offer some of my top tips when it comes to capturing beautiful getting ready photos. The getting ready period is a time for you as a photographer to build rapport with not only the couple (if you haven’t worked with them during an e-session) but also their bridal party and family. If you do this successfully, then you’ll have their trust and cooperation throughout the rest of the day, which will make your job that much easier. They’ll be more relaxed and comfortable in front of the camera and more willing to be “in the moment” and follow your instructions. That being said, there are lots of challenges we have to work with when capturing getting ready photos. Sometimes the rooms are messy and cramped, with the area of natural light near the window occupied by the hair and makeup artists. Perhaps the guys don’t really want to have their portraits taken and are feeling extra uncomfortable. In my opinion, addressing these challenges is all about preparation and in this podcast, I’ll share with you some of the ways I go about it. I send my couples a PDF packed with wedding photography tips for them to keep in mind throughout the day, as well as a questionnaire so I know who their bridal party is and the names of their immediate family members. I also recommend using two camera bodies so you don’t have to keep changing your lens, with one body fitted with a variable focus lens and the other a telephoto like an 85mm or 100mm.